Well the pace of my options activity finally slowed down with only 6 options moves to report for last week. Although that's not entirely true because this only includes the open and closed positions that don't need any further explanation and believe me there's plenty needed. Essentially I have 2 put options that while I was okay taking the shares I decided to roll the contracts out in time to collect additional credits and move my break-even's down. Sometime later this week I'll go through all of the moves I made to keep everyone up to date on how things stand. Becton, Dickinson & Company is one of those companies that keeps flirting with where I'd like to buy shares. It's also a good combination of a higher price stock that is seeing a bit of volatility which increases the premiums you can collect when selling options. Prior to this put option I had opened and closed 4 different put options on Becton, Dickinson over the last 5 months bringing in over $400 total of net premium. My goal when I enter into any option trade is take advantage of the ever present factor of time. That usually entails selling a put option, waiting for time to pass and hopefully the stock moves higher and I can close out the position early for a profit. However, sometimes that happens in a short time frame and I didn't even get to report about opening this position before already closing it. The net profit on this contract worked out to $74.91. Based on the $17,000 of capital "at risk" that's a 0.44% return. However, if you check the dates on that it was earned in only 4 days making it an annualized return of 70.8%. I was able to capture 65.2% of the max profit in just 16.7% of the days to expiration. I've been thinking of shifting towards closing less positions and letting things run their course, but I also understand the benefit of locking in gains when you can. I was willing to let this run further, but I decided to close out the put early because I had put myself in a position where I was over-exposed to the markets. Since all of the put options are cash secured it's not a huge risk if the markets make a big move downward; however, I also want to have some cash available to make big moves in case that happens. I had let myself get up over $100k of capital tied to put options which was frankly way too much so that mean it was time to manage some winners. This Johnson & Johnson put was another one where it just made sense to close it due to my overexposure to put options. Especially since I have a 2nd put option open on Johnson & Johnson right now at the same strike price. This contract on Johnson & Johnson generated a net profit of $109.91. That's a 0.64% return based on the $11,300 of capital used to secure the put. On an annualized basis that's a solid 11.11% return. Since Johnson & Johnson's share price has been hovering right around the $113 strike price I wasn't able to take advantage of the time decay like I prefer. I was only able to capture 54.5% of the max profit, but it took me 73.3% of the days until expiration to do so. It wasn't ideal, but it was good for the portfolio and who can really complain about making a profit? 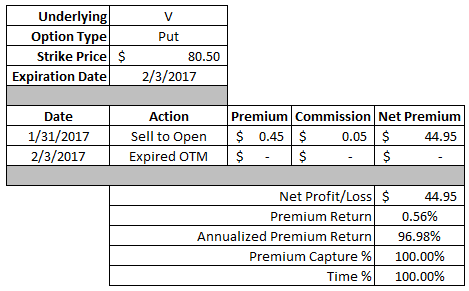 Visa is another company that I've repeatedly sold put options on over the past few months. This put option was a bit different than what I look to do, but it was a risk work taking. So I went with a short dated put option that was expiring just 4 days after the contract was opened with the expectation that Visa would head higher. The catalyst was that Visa had earnings coming out this week that I expected would be great results and they didn't disappoint. The profit on this put option wasn't spectacular at just $44.95 or 0.56% based on the $8,050 of capital in play. However, since it was earned in just 4 days that's a whopping 96.98% annualized return. Since the option expired out of the money I was able to capture 100% of the profit in 100% of the days to expiration. When it comes to dividend growth investments Johnson & Johnson is a staple in many portfolios and for good reason. They might not have days of 10%+ growth ahead of them any more, but there's something to be said about a steady and consistent 5-7% per year bump. If Johnson & Johnson's share price falls below $113 then I'll have to buy 100 shares of the company for the strike price less the premium received. That will give me an effective purchase price of $111.90 per share which is about a 0.91% discount from the current share price. At that purchase price the valuation looks compelling. The trailing P/E, based on 2016's earnings, works out to 16.6x and the 2017 forward P/E based on analyst estimates would be just 15.9x. 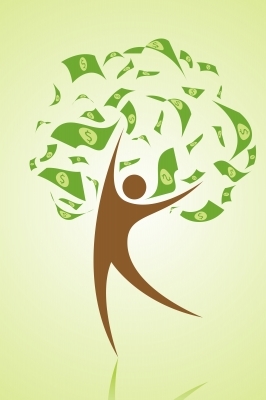 At the current quarterly dividend rate of $0.80 the yield on cost would be a solid 2.86%. If Johnson & Johnson's share price is above $113 then I'll get to keep the full option premium as profit. Since the put option requires $11,300 to secure the contract that's a 0.97% or 21.71% on an annualized basis. 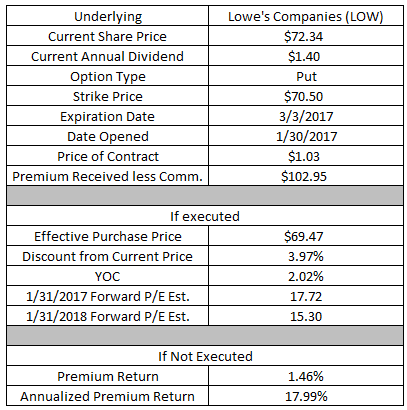 Lowe's is another company that I want to add to my portfolio, but keeps being just outside of my buy range. That's no problem though because it allows me to sell puts, collect premium and wash, rinse, repeat until I can finally add the shares to my portfolio. If Lowe's share price falls below the $70.50 strike price then I'll have to buy 100 shares at that level. However, since I've already received the premium up front my effective purchase price will be $69.47 per share. That's 3.97% of downside protection from the current stock price. The valuation at that level looks solid. Based on the estimates for the latest fiscal year that ended 1/31 the P/E would be at 17.7x. Looking out to the end of the current fiscal year ending 1/31/2018 the valuation would be just 15.3x. Based on the current annual dividend of $1.40 the yield on cost at that price would be 2.02%. If Lowe's share price remains above $70.50 then I'll get to keep the full $102.95 option premium as profit. That's a solid 1.46% return based on the $7,050 required to secure the put option. Since the return would be earned in about one month's time the annualized return works out to 17.99%. Starbucks announced earnings that were apparently not up to par for Mr. Market. The share price then sold off from around the $58 level down under $54 in the aftermath. That's perfect for me because I was targeting a purchase of shares around $50. The share price didn't quite get there so I went to the options chain. If Starbucks' share price falls below $53.50 then I'll have to buy 100 shares for that price less the $67.95 of premium I received. That lowers my effective purchase price to $52.82 and is around a 2.90% discount to the current share price. At that price level the valuation doesn't look great, but it does start to get interesting. Looking at the last fiscal year which ended 9/30/2016 the trailing P/E would be 27.7x. However, Starbucks is still very much a growth play so a bit of a premium is to be expected. Based on the analyst estimates for the current fiscal year ending 9/30/2017 the forward valuation would be 24.8x. 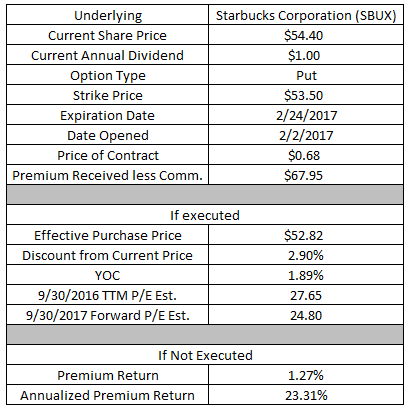 Starbucks currently pays a $1.00 annual dividend putting the yield on cost at 1.89%. If Starbucks' share price rallies after the post earnings drop, as I expect, and remains above $53.50 then I'll get to keep the option premium as profit. The premium would represent a 1.27% return based on the $5,350 of capital required to secure the contract. The annual return would come to 23.31%. 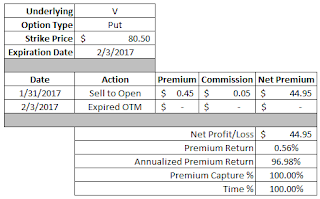 Thus far in February I've been able to generate $249.68 in profit via closed/expired options. Year to date I've collected $1,879.07 in option premium profit. in your "Johnson & Johnson (JNJ) - Sell to Open Put Option", the current price is "112.93"----it's already below strike price of "113"....did I read it right? I am new to options and would like to learn. How do you get premium numbers? hope you write an article about options 101 for dummies..LOL. Yes at the time that I opened that contract JNJ's share price was less than the strike price. However, with options there's always the time value that comes into play. 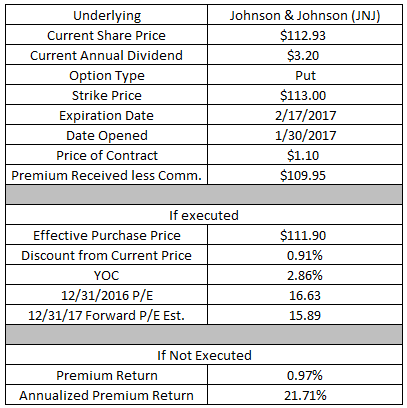 I was pretty bullish on JNJ so I went with an at the money contract to try and bring in more option premium. Essentially it was a risk/reward tradeoff. The premium numbers can be found at your brokers website. The same as how when you buy shares there's a bid price and an ask, options have the same thing. This post kind of details what I aim for with put options. But the option transaction posts that I've been doing each week pretty much sums up my strategy. Although I'm wanting to start trying to do more spreads/defined risk positions because it really bumps up the return on capital and allows you to get a lot more positions on with the same amount of cash in your account. If you want to learn more about options I honestly don't think I could cover it any better than what Option Alpha can. There's a lot of free information there that you can learn from so I would start with something like there. There's just way more information than I could ever hope to provide in a reasonable amount of time. If you have any questions feel free to email me or ask away in the comment section.